Ever wanted to visit a traditional and safe part of the Arab world without encountering multiple shopping malls, fountains and excessive wealth? Oman is your answer! With it’s low-rise towns retaining their traditional charms, Bedouin values remain at the heart of an Omani welcome. 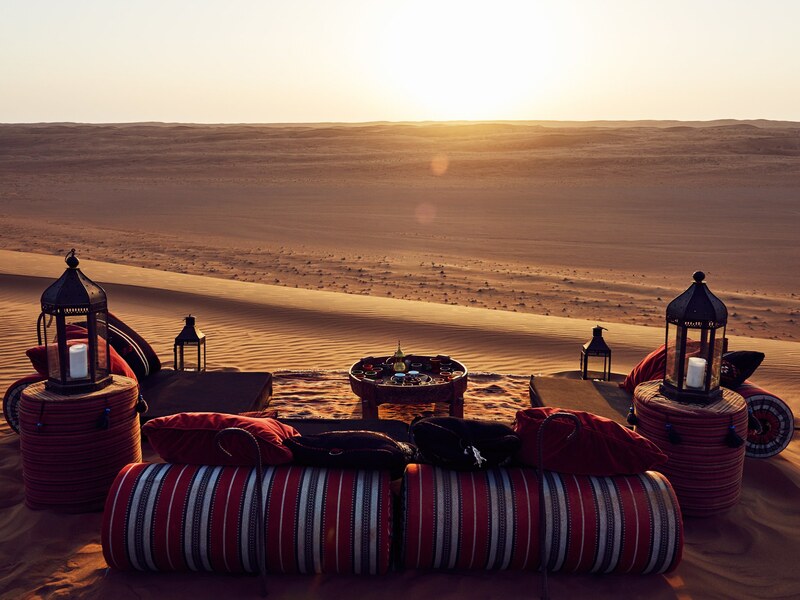 With an abundance of natural beauty; from spectacular mountains, wind-blown deserts and a pristine coastline, Oman is the obvious choice for those seeking out the modern face of Arabia while wanting still to sense its ancient soul. YPT are arranging our first ever foray into this Arabian Peninsula Sultanate. The tour closes our odyssey through the Arabian peninsula, with tours to Jordan, Lebanon, Iran, Iraq and Iraqi Kurdistan right before it why not do a couple together while you’re on the peninsula? They are all easy to combine for additional discounts! Arrival in Muscat, Oman at your convenience. Meet your fellow travel buddies in the lobby of our hotel, the Riyam hotel, at 6pm before we go out for our first dinner together and get acquainted. Big breakfast before we head out for our city tour of Muscat. We will visit the Bait Al Zubair Museum. The Sultanate of Oman’s preeminent museum! Next we’ll have a photo stop at the official residence of his Majesty Sultan Qaboos Bin Said, The Al Alam Palace, which is flanked by the 16th century Portuguese forts of Mirani and Jalali. From the Palace, we’ll take a walk through the old town – the real Muscat! We’ll see the Muttrah Corniche and visit Muttrah Souq which retains the chaotic atmosphere of a traditional Arab market albeit nowadays housed under modern timber roofing. We’ll stroll through the Souq, where you will have the chance to buy Omani specialties like Frankincense and Omani daggers. Bargain hard here – your local guide will be on hand to help you reach the best price! Next we’ll head for diner and then have tea along the corniche taking in the cruise ships along the water at Mina Al Sultan Qaboos Port. Head back to the hotel and Overnight at the Riyam hotel, Muscat. Breakfast at the hotel and Pick up time 8.30 a.m.
We will travel through the mountainous landscape arriving at the dramatic Bimmah Sinkhole for one epic swimming location! Once suitably refreshed we’ll depart for the drive south toward the direction of Quriyat which contains some of the most spectacular Wadi (valleys) in Oman. Upon arrival at Wadi Shab we’ll transfer to a small fishing boat to sail across the wadi. The word breathtaking is an understatement! We’ll walk through this amazing canyon until we find the famous Keyhole where we can relax and dive in the pools. Through the keyhole you will find a magnificent cave, complete with an incredible waterfall. Free time and relax at the hotel before dinner at 7:30 p.m.
After dinner it’s off to the Ras Al Hadd beach in search of turtles! There is no guarantee of any sightings as it is a natural phenomenon but sightings are very common. Breakfast at the hotel and departure at 8:30 a.m. Our first stop will be at a traditional ‘Dhow’ building (wooden ship building factory), where Arabian dhows have been built by traditional carpenters for hundreds of years. We leave Sur and travel to Wahiba Sands famous for its multicolored tones. We arrive and set up for the night at our very own Desert Camp. 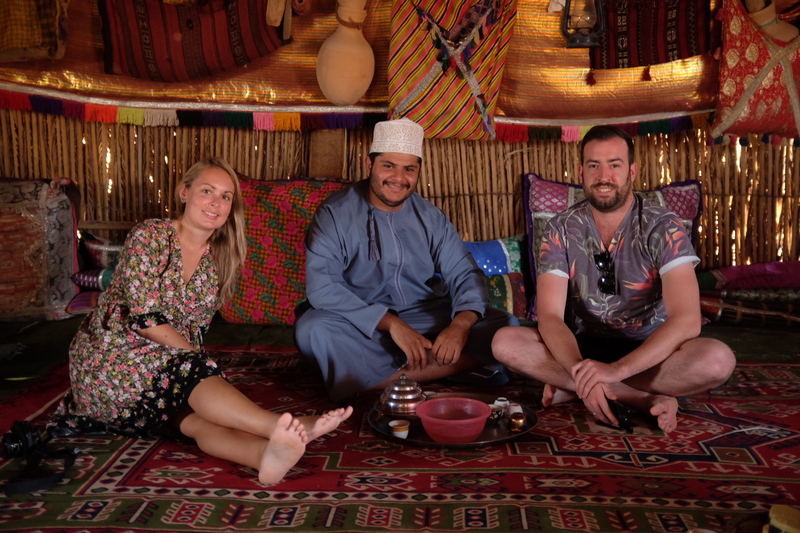 The camp is a Bedouin style air conditioned accommodation with private bathrooms! After working up an appetite it’s back to camp to experience the local Arabic Cuisine. Sit back and relax around the camp fire whilst enjoying the live entertainment the camp has to offer. Rise and shine for an early breakfast at the desert camp. We depart on a wonderful 4WD journey through the nearby mountains. 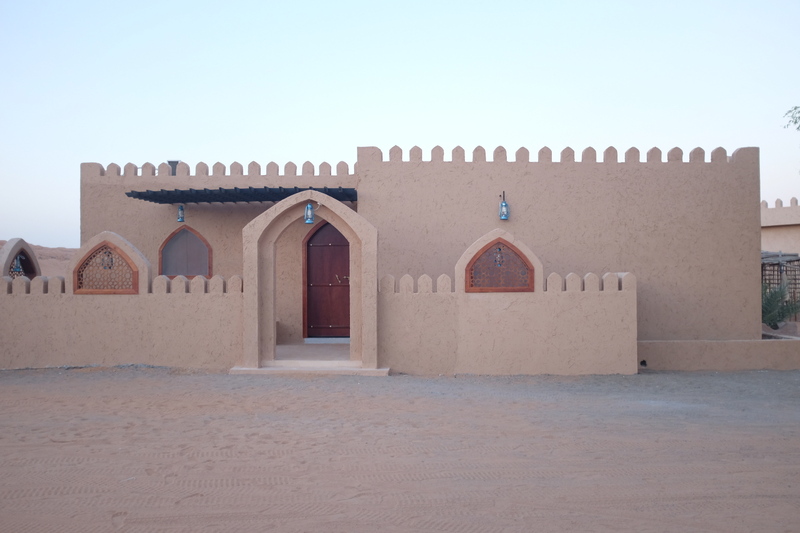 Our first stop will be Wadi Bani Khalid. 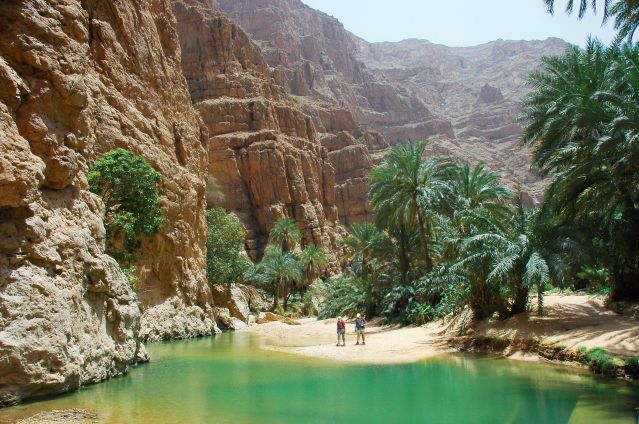 The wadi has clear deep blue water and holds its water supply all year round. We also check out the villages of Wadi Bani Khalid that cling precariously to the rugged mountainside. After a buffet lunch at Wadi Bani Khalid, we continue our journey and drive up the Mountain to the stunning Grand Canyon of Oman. The panoramic mountain drive brings us to Jebel Shams (Mountain of the Sun), the second highest peak in the Arab Gulf region, rising to over 3000 meters. We will check in at the resort in Jebal Shams, have dinner and spend the night at a traditional eco chalet. After breakfast we will check out from the resort and head to the cultural capital of Oman – Nizwa. Visit the Nizwa traditional Souq. The Souq is a lively place and an ideal location to purchase handicrafts and souvenirs. After a little bargaining in the Souq it will be time to begin the journey back to Muscat. Arrive in Muscat and end of tour. YPT can arrange extra accommodation or travel to your next destination. Or why not leap across the sea and join us in Ethiopia? 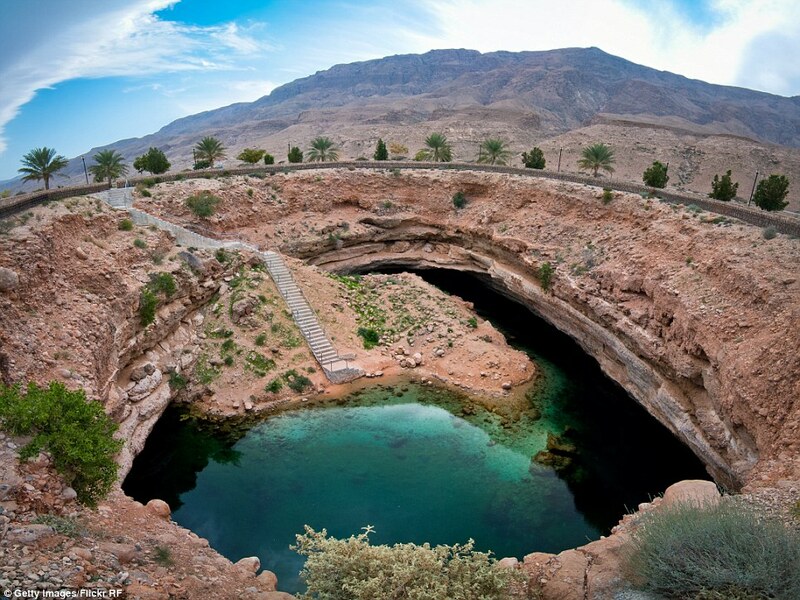 Swim in the epic Bimmah sinkhole and go turtle watching in Sur. 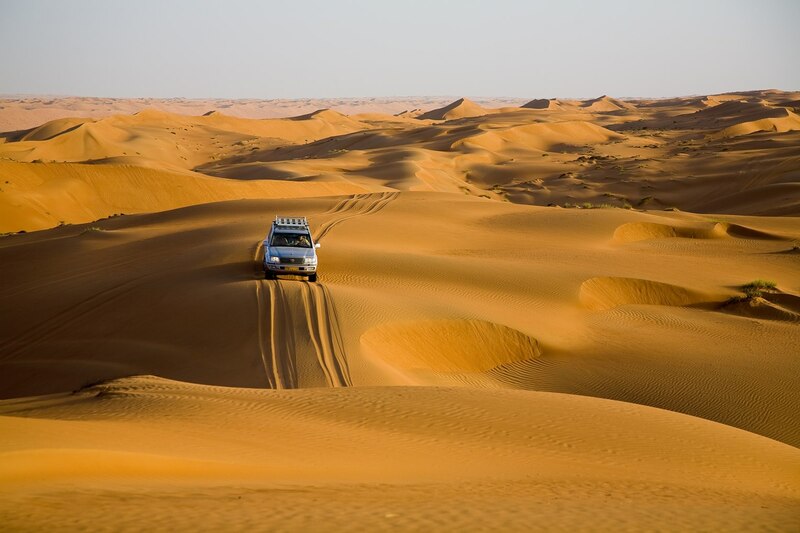 Go 4WD across 150 meter sand dunes! Finish up in Muscat or Salalah - prefect timing for the tour to Socotra island!